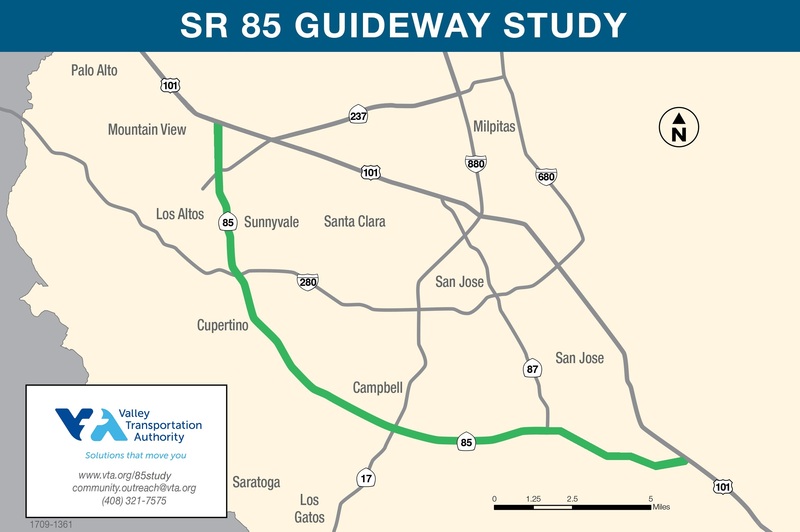 The State Route (SR) 85 Transit Guideway Study evaluates transportation alternatives of the 23.7-mile corridor that connects the cities of Mountain View and San Jose, from the SR 85/US 101 interchange in Mountain View to the SR 85/US 101 interchange in South San Jose. Study alternatives will include Bus Rapid Transit service and infrastructure, Light Rail Transit, and possible future transportation technologies or other options. The SR 85 Transit Guideway Study will be conducted by VTA staff under the direction of the SR 85 Policy Advisory Board (PAB). The advisory board will be instrumental in identifying the alternatives that will be analyzed and ultimately making a recommendation to VTA’s Board of Directors about how to proceed with a transit improvement plan along the SR 85 corridor. VTA values input from the community and we believe that more voices help us produce better outcomes. Join project staff in discussing the State Route 85 Guideway Study at phase 2 public meetings scheduled mid-2019. Individuals who require language translation/interpretation, American Sign Language or other assistance are requested to contact VTA Community Outreach at (408) 321-7575 TTY (408) 231-2330 at least five (5) business days before the public meeting. The SR 85 Corridor Policy Advisory Board ensures the stakeholder cities in the SR-85 corridor are involved in the development of existing and potential transportation capital projects along the corridor and have the opportunity to provide input and recommendations to the VTA Board of Directors. View meetings and agendas. VTA filmed the San Jose meeting. The City of Cupertino filmed the Cupertino meeting. Community meeting dates will be determined at a later date. Subscribe to be notified when they are scheduled. * Phases of this project are on hold contingent upon funding. What is happening to the funding?